Not to be confused with World Milk Day on June 1, National Milk Day falls on January 11 to observe the very first time milk was delivered to homes inside sterilized glass bottles. It took until 1878 before anybody thought to fill bottles with milk and seal them with waxed paper. Before that, conditions for storing milk (let alone delivering it) were unsanitary at best and downright hazardous at worst. But now that we have the technology to pasteurize and deliver fresh milk to homes, stores, and processing facilities across the country, this most basic type of dairy is more accessible than ever before. By today’s standards, milk with its nine essential nutrients is considered a staple food, technically able to support human life without the addition of any other food groups to balance it out. (Other life-supporting foods include sourdough bread, chicken eggs, red beans, and surprisingly, beer!) 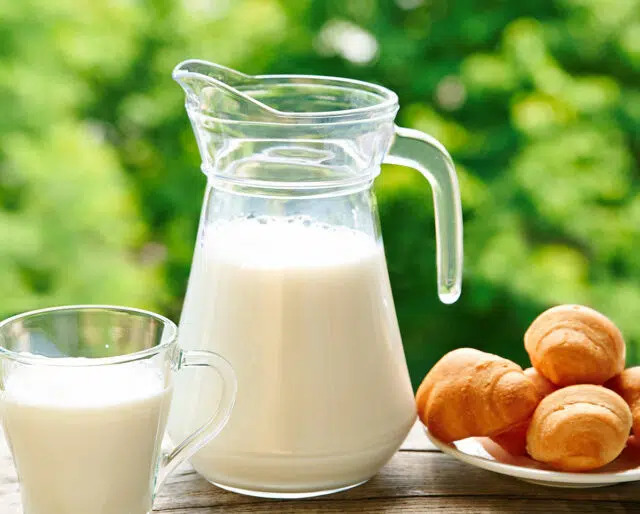 Of course, most of us aren’t on a milk-only diet, but milk is our very first food as babies and often remains a common source of nutrition throughout our adult lives. For National Milk Day, we invite you to join us in celebrating the oldest and arguably the most natural food for all the mammals of the world — milk. As a staple food available at practically any grocery store, milk is one of those foods we tend to take for granted. It's always there on the shelf, cold and fresh and ready to come home with you. But how much do you really know about milk? On National Milk Day, you can read up on milk's nutritional value or find out more about the new hormones detected in modern milks. You could learn about how cheese is made, or, if you're more into history, learn about how milk pasteurization literally changed the world! The dairy food group is one of the most diverse, even though it is all derived from one basic food. It's pretty likely there's some kind of dairy that you just haven't tried. Give yogurt a go, see if you like cottage cheese, or try out gelato (the Italian version of ice cream). If you're already a dairy connoisseur, take it to the next level with a bite of stinky Limburger cheese or crumbly feta made from goat's milk. Love traveling? Dare yourself to take a sip of fermented mare's milk, Mongolia's favorite drink. Not all areas are well-suited to raising dairy cows, but thanks to modern cold storage and sanitary milk transportation, there's probably a milk processing plant near you. Most dairy facilities offer tours for visitors to learn more about how milk is made into countless other foods, and National Milk Day is the perfect excuse to go see the process for yourself. Better yet, many dairy tours offer free samples of their wares, and some of them even have onsite stores for you to buy your favorite products directly from the dairy. Milk is packed with vitamins, minerals, and other nutrients important for your health. It contains nine essential nutrients (calcium is just one) that your body needs to live, and it also delivers some non-essential nutrients like sugars and fats, which can provide your body with the energy it needs to function. And while cow milk differs from human milk in fat content and nutrient ratios, its basic components are close enough for us humans to benefit from the beverage. Milk is pretty great by itself, but this creamy white liquid is also the foundation of the entire dairy food group. We have whole milk, where none of the milk fat has been separated, as well as lower fat-content milks like 2%, blended, and skim milk. Then there are the creams, which are the higher fat-content milk products that we've removed from the skim milk. Like milks, creams vary in fat content depending on how we'll use them — heavy creams are used to make butter and whipped cream, while lighter creams are used to produce dairy variants like yogurt, cheese, and ice cream. Most kids like to drink milk, but National Milk Day is a great opportunity to get them interested in why they like to drink milk. Studies show that children are more proactive about their food choices when they understand how their decisions impact the way their bodies feel. National Milk Day empowers kids to learn about what milk brings to the table, and it also raises important questions about the differences between organic milk and other milk options, helping kids understand how certain chemicals given to the dairy cows can end up in their glass.